Hi There! The August Technique Challenge over at Club Scrap is Vintage/Sepia! Artist Team member Hetty hosted this month and she did a great job sharing the technique! 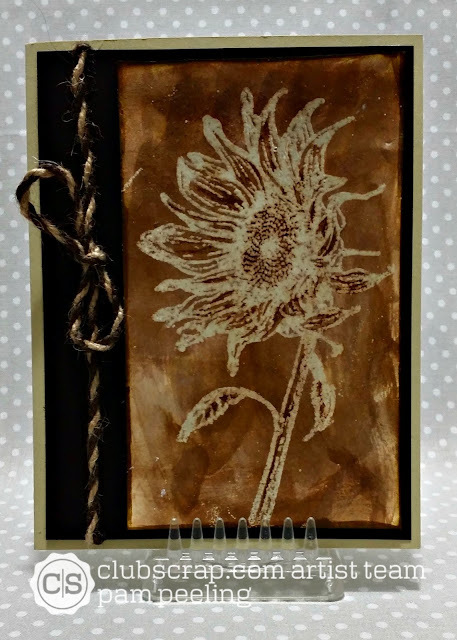 I used the Club Scrap Sunflowers kit to make this card. I kept my card pretty simple. I stamped the image with clear versamark and used white embossing powder for a embossed resist. I just painted on the sepia coloring using Distress "vintage photo." I used my aqua painter to get a washy look. DONE! Sepia coloring! I hope you try your hand at this technique and link it up at Club Scrap! Awesome card, Pam! It does not have to be difficult to be beautiful!